DAY 48: Today was one of those grinding days. But even on a rough day that ended after 75 miles in temps that hit triple digits, according to one local thermometer, there were some lovely moments. Mark surrounded by a sea of fog. MELODY: Since Ragbrai ended, we took a few days off from camping and landed in a motel in the small town of Galva, Illinois. It was here where my faith in humanity was restored. Let’s all agree that it’s been a rough summer (violence, ugly political rhetoric and general unpleasantness in the world news) so it was a lovely surprise to feel that humans are, well, nice. It happened in a small bakery. Empty windows and long-shuttered family-owned shops (perhaps due to the WalMart about 12 miles away) fill the old town square in Galva. It was once a thriving Midwestern town and a popular landing spot for Swedish immigrants in the early 1900’s. Once the trains came, the town grew exponentially. But, like many small towns in America’s heartland, this charming town fell on hard times. The main employer today is a factory that makes casket parts. Please put money in slot in metal box behind the glass case. If you don’t have the correct change (no problem) just put it in the next time you visit our bakery. 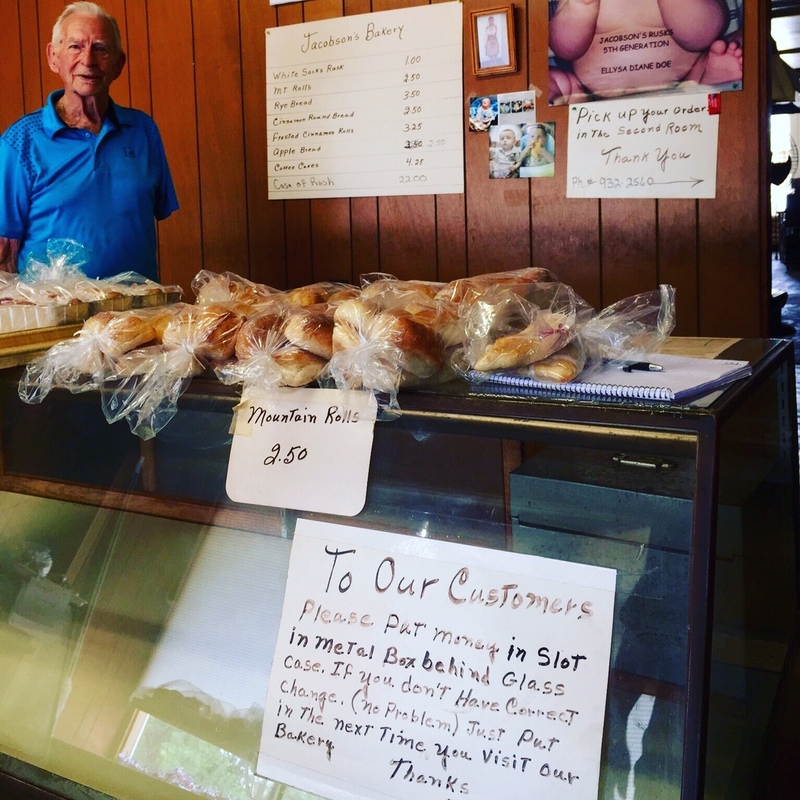 Dwain Jacobson is a fifth-generation baker who believes in the honor system. He said that sometimes, very rarely, there are people who take advantage of it. But it has never occurred to him to change the way it’s always been done. “It’s a small town and everyone here knows that’s how we do things here,” he said. He wouldn’t have it any other way. Most of the time, there isn’t anyone here during the day. But 87-year-old Dwain happened to stop by for a few hours to mix some dough for the lady who makes the Rusks in the evening. So we asked him what happened to his arm. When he was a boy, he fell off a tractor. His arm got caught and life as he knew it ended. But that never stopped him from doing the work he loves and finding people to love. We stocked up on Swedish rye bread, cinnamon rolls, rusks and fruit danish and said goodbye. Grateful for the opportunity to meet such a sweet and kind soul. I thanked him. It was the second time in one day that I started to feel that there is hope for the future. At least in some small towns in America, honesty and kindness still exists. Oh, and in case you get to Galva, the Jacobson’s Bakery door is always open. Even if it looks like it’s closed and the lights are off, the doors are never locked. Go get yourself some bakery and restore your belief in the goodness of humans. If you can find it. Oh Mel, I read this with a tear in my eye. I’m so glad that you, our Big City gal, found this humanity in a small town in the middle of the country. Welcome to small town America, Tune! I am the wife of the guy in the red truck……..Yes, Galva is one of those unique little towns in the middle of no where. It is interesting to know how WE chose to live here. My husband, Frank, was a NCOIC over Army recruiters and his territory covered this area. He had already been transferred here and myself and two teenage children were still at the Military base in Rantoul, IL. It was 1992 and the Air Force Base that we called home was closing due to budget cuts. We had to find a place to live so we could all be together again. Each week Frank would come home to get me and we would scope out where we wanted to live. We narrowed it down one day while having coffee by taking out a map of Illinois and Frank saying this is my recruiting area, ” where do you want to live at”? So we took a cup and drew a circle around it and started checking out every town inside the circle……even the towns with 200 people. After several weeks of doing this we had it narrowed down to two towns. We went to the first one and walked down the street for two blocks, we said good morning to everyone we passed, but no responses. We then came to Galva, sat down in a little cafe and found ourselves listening to all the farmers that had come in for their coffee breaks. It was amazing!!! We found out all the local gossip in town in less than ten minutes and found ourselves smiling. We then walked a couple blocks down the main street and once again spoke to everyone we passed and everyone was so friendly and helpful. I was beginning to feel like I was meant to be here, this would work as it had friendly people, good schools, and only 45 miles away from my parents. So in July 1992 we were all reunited together and setting up life in Galva. Sure it has some draw backs, but where can you leave your house unlocked and go on vacation for two weeks and everything still be there just like you left it. Where can you go and just ask anybody and they can give you directions to your house. But most of all the community spirit is alive and well here. If someone is ill there are coffee cans in all the stores so that you can drop a dollar or two to help out the family, have a big benefit and the whole town turns out to help, or like us in 1996 get hit by a tornado and have 85 people in your yard clearing away 13 downed trees and you only personally know 15 of these people. Humbling indeed. The fact is we could have chosen anywhere within the circle on that map, but we chose Galva because of the people and the spirit in this small town of 2600 people. We are a tight knit group here. Everybody knows everybody and cares about each other and helps with whatever the cause. We hope that you enjoyed your stay in our little town and it has regained your faith in people. There are still good people in this world today and you were shown just two of those in Galva, IL.